Hon Shiogama has the highest sushi restaurant per capita, that’s what the tourism industry claims. Out of all, the best recommended sushi restaurant is Kameki Sushi which uses all local products in their menu. On weekdays, they are open from 11:00 until 22:00 and on weekend from 11:00 to 15:00 and 17:00 until 22:00. From Sendai Eki take the Senseki line and go out at “Hon Shiogama”. Just out side the station on the left side is Aeon Mall. To get to the restaurant, walk down the road pass the fire fighter building. Go straight ahead and turn left by the store that sells materials for Shinto prayers. The highly recommended menu is their sushi platter. 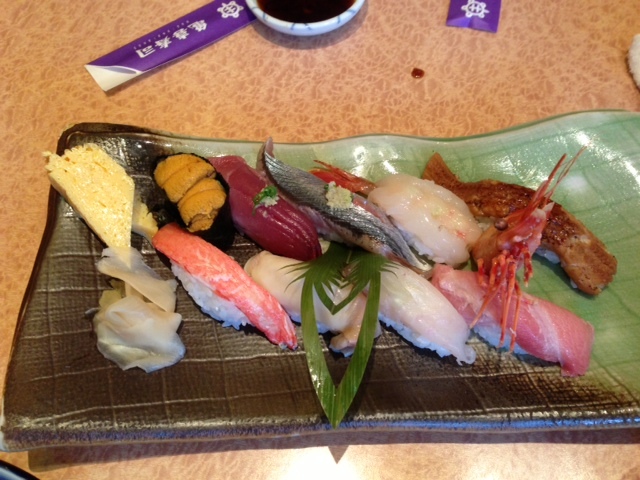 The platter consist of sushi with toppings: (above) tamago yaki, uni, maguro, sanma, ebi, unagi. (below) crab leg, abalone, squid and toro maguro. Oh boy they were warm and delicious, my ultimate favorite is the uni right next to the tamago yaki. My husband was really impressed. The Sushi platter comes with two soups for you to enjoy. 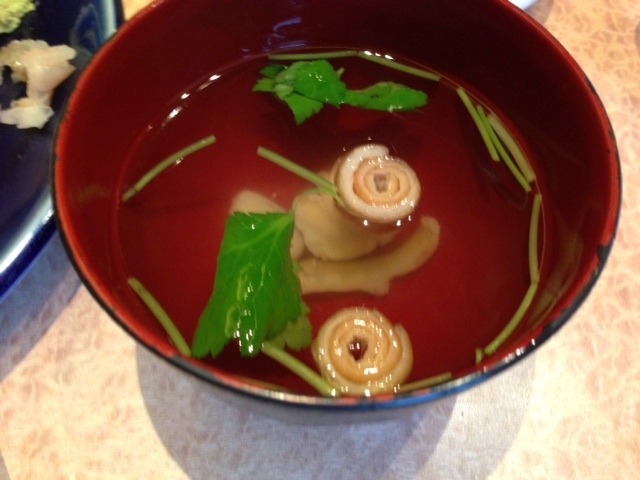 It was plain dashi with some green leaves and dried bread. Of course dining for us is incomplete if we don’t order their in season sashimi platter. Look that glorious fresh seafood. 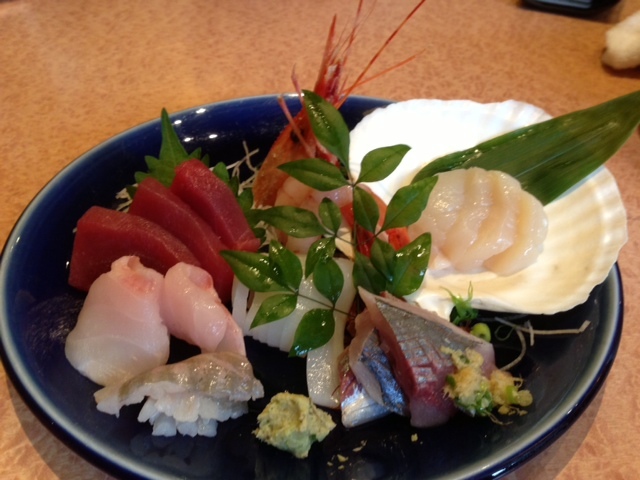 They serve maguro, tai, ebi, ika, sanma, hotate and another ebi on shredded daikon and shisho leaves. For so long that I have lived in Japan, I always wonder how people can get their tummy full after ordering only sashimi. 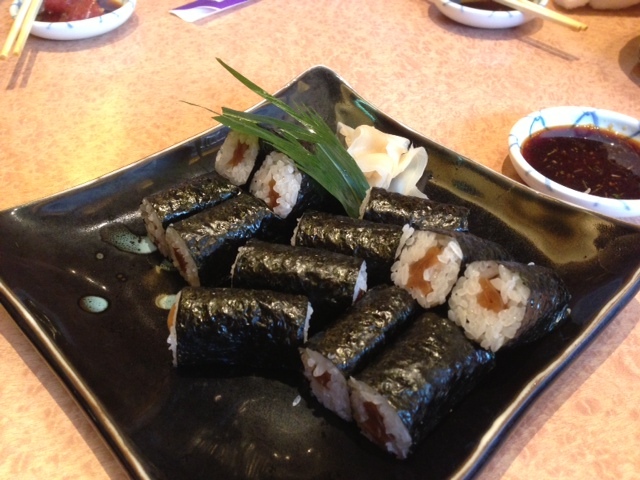 So the waitress taught us to order a plate of maki sushi to go along and this was their recommended selection “kanpyo”. This was a wonderful dining experience. Life is good when the food is good. Bring your business partner here. Book in advance and then talk about the deal. November 23, 2013 in Reviews. Drool drool drool …. even the colours are “delicoius” ! oops, I meant “delicious” . They are the best in town..